One of the most interesting animations I have ever ever seen, this multi award winning Brazilian movie will stick with me for it’s refreshing originality, message and complexity. I only wish I’d seen it before now but at least I’ve seen it and I hope it reaches a wide audience because it deserves large viewer ship. A young boy living in a house away from the hubbub of a fictional city with his mum and dad, sees his father leave by train one day. He keeps seeing his dad even when he’s not there so one day the child decides to board a train and try to reunite his family leading him to see more and more of the world. Ale Abreu’s direction is near flawless; the decisions he makes in expanding this textural world are luscious and seamless. Each scene or new landscape is a transition of pure poetry with lines sprawling into the next white screen to create the next new location. He certainly knows how to direct an animation that speaks volumes even when there is no dialogue. That’s the thing, with a film of next to no talking this film is rich and weighty and just sublime. There may be a couple of ideas in Abreu’s screenplay that lost me, whether it’s endless dads or the pre-ending home scene but all in all this is a cleverly written script that utilises on a rainbow world for children with grown up themes and very oppressing visuals and subtext to hit home for the adult watchers. When moving on to the animation, it must be said that you’ve not seen anything like this before, almost guaranteed as we see ever growing worlds filled with technology, absurdity and newspaper cuttings mixed in with the hand-drawn like characters. It’s artwork is mesmerising, just the opening alone with it’s kaleidoscopic and hypnotising lines and swirls draw you into the bright world. A video game looking section as shipping containers get sucked into glass domes or the first train sequence filled with white rails and a black screen shuttling us into the city land are two further examples of how amazingly unique this film is. Ruben Feffer and Gustavo Kurlat more than make this film too, with their engaging musical contribution. The festival atmosphere and harmonic singing from time to time is distinctive and then there’s the neat sound used. Accordions for car horns or clapping when rain hits the ground. It’s a film fascinatingly magical in colour and sound. I must also comment on a moment when the cartoon burns and peels away, what an impacting surprise and though there’s been hints to the deep presence of life and Earth shattering changes before now, this is when we fully see one message of this film which raised hairs on my arm and neck. This film is political but not overly so that cute critters and colourful innocence still keep interest for the little watchers. Apart from a tiny sprinkle of confusion and white screen pain this animation is sensational and I feel better for having watched such an interesting and vibrant story. A nimble and spritely film filled with many moments of adventure and drama told in a breezy way. The story and setting stand apart from a lot of what has been released recently and as a huge fan of ‘City of God’ this movie presents that same kind of look and style, turning it into a pleasurable and well told cinema outing for myself. Working on a waste site in Brazil Rio de Janeiro, Raphael (Rickson Teves) comes across a wallet full of money and other items that lead him to believe it best to keep. Bringing in friend Gardo (Eduardo Luis) and the assistance of sewer kid Rato (Gabriel Weinstein) the three boys need to stay one step ahead of nasty police head Frederico (Selton Mello) and find out the mystery of the wanted wallet. Stephen Daldry directs this British/Brazilian film with a neat flair and puts across a heartwarming and vibrant tale that captures emotion and the theme of doing what is right with thanks to the writing brain of Richard Curtis. This notion of sticking to the law and seeking the right path is a lovely central story point to run with and it never feels tired even if a lot of movies do use this theme. Also the title itself of ‘Trash’ cleverly links in with the workplace of Gardo and Raphael, the brutal way police treat Brazilian kids and the manner of which some big amount of money is transferred. The direction slickly cuts together frames featuring the kids to past shots of the wallet owner in the same place, making the film feel smoother and putting the kids on the right track. 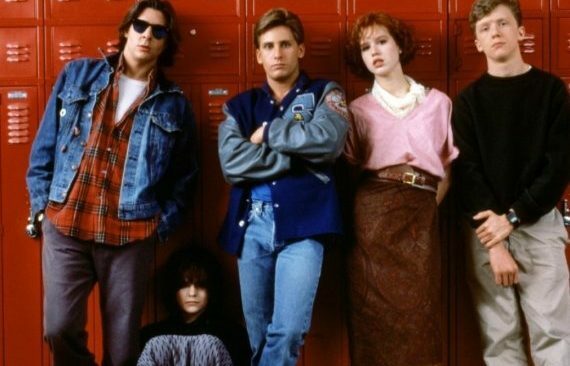 The way that a certain moment of horror is shown is moody and filmed in the dingy nighttime, cut fast and left to our imaginations as one of the young lads is subjected to masked torture in the back of a spinning cop car stands out as a big moment. It’s also something to point out that the film makes it clear Brazil has its issues, white figures in authority treating civilians like nothing and getting away with it. Including this scene hits that terrible truth home. 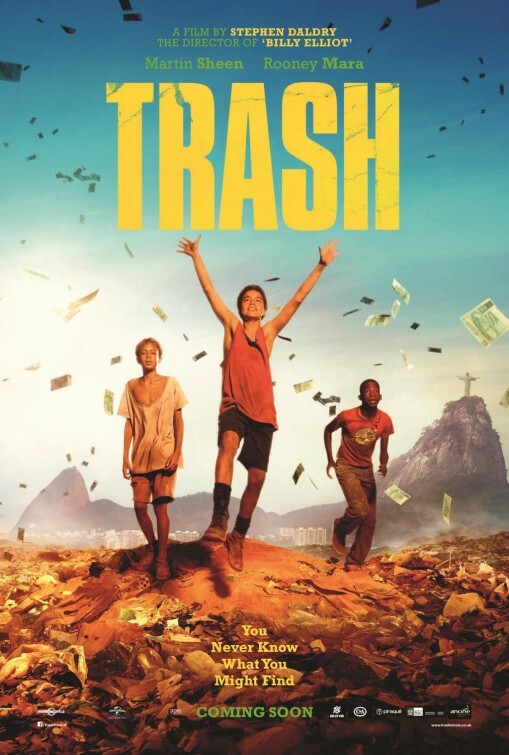 ‘Trash’ never feels slow and the story is energetic and as we see Brazilian settings on screen, they’re presented by Adriano Goldman in a pacy way shining atmosphere over shots of the favelas, Rio streets or a certain key graveyard. The choice to feed in a smaller ratio frame of grainer video footage of the three boys accounting to camera gives the movie more of a real edge that work in agreeable favour with me. Though it is quite predictable that there will be some resemblance of a happy ending it isn’t so obvious to how that ending will come around so that’s nice to have. Antonio Pinto’s score is pulsating and ties in with the breezy nature of the film’s vision. It’s a colourful and exotic sounding series of tracks that heighten the escapes of the kids or the whizzing edits of the film in general. Drum beats and steel sounding smacks whack through scenes with positive impact and help the adrenaline of the trio’s situation feel more racing. All three of the actual Brazilian teens playing the boys on the run are sheer delights. Charismatic or being scamps they draw a smile or on the welcome flip side they showcase heavy emotion in the light of their injustice and in particular seeing their home burning. It’s also a nice point to have Martin Sheen and Rooney Mara appear as white faces that look out for the Brazilian people and are kind to their cause. The film could easily have painted a broad stroke of whites as the brutal forces but it doesn’t and that’s a good move. Far from garbage this is a treat for the senses, loud and engaging and akin to the bright and bloody style of ‘City of God’ this film is an escaping fun and yet dramatic adventure in South America, forever lined with the factual message of people being the same and therefore should be treated as such.